4. JUMP! The Adventures of Brer Rabbit. A rollicking retelling of the classic Brer Rabbit stories. 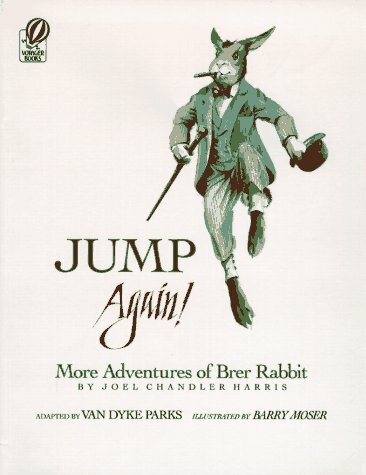 In this adaptation of the Joel Chandler Harris stories, children and their lucky parents can watch the wily Brer Rabbit outsmart time and time again his predatory neighbors and prove that brains really are better than brawn. The difficult dialect of theChandler Harris originals has been updatedand simplified for modern readers, and these beautiful volumes (there arethree books in the series) are brilliantly illustrated by award-winningartist Barry Moser. This book is a must-have; I can't imagine why it isn'ta best-seller. 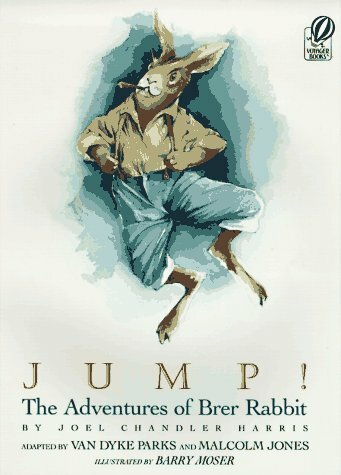 Five favorite narratives from the Uncle Remus series have been released in a stunning edition, Jump!The Adventures of Brer Rabbit. Vigorously whimsical illustrations by master wood engraver Barry Moser decorate the folio size sheets.Happily for all Brer Rabbit continues to outwit Brer Fox, and Brer Terrapin again winds up the winner.Earmarked for all ages. 4. JUMP! The Adventures of Brer Rabbit. Adapted by Van Dyke Parks & Malcolm Jones. Many years ago my 4th rgade teacher read this to the class after lunch. we will accomplish what God has planned for our lvies. This is one of the best Christmas gift a parent can give his or her child, betwen the ages of 6 and 60. This is a very nice retelling (NOTE THAT IT IS NOT VAN DYKE"S ORIGINAL STORY) of the classic story by Van Dyke.The illustrations are rich and beautiful and the retelling makes the story much shorter and understandable for younger children though the wording is not condescending so is still appropriate for older children, too.It makes it a greatbedtime story. This may just be because I am related to Henry van Dyke, but, I LOVE this book! It is a very touching book. I would absolutely recommend this book for any age, 2 years or 95, you will love it!!! 7. JUMP! THE ADVENTURES OF BRER RABBIT [first print] 1st Ed.